Conservatives are getting all worked up about the “food stamp president” again. But now they're not just talking about President Obama. They're also talking about former President Bush. Hard to believe? It shouldn't be. It's just one more sign of how extreme mainstream conservatives and their Republican allies have become. The argument comes as congressional Republicans are on a crusade to slash funding for food stamps, which is now known as Supplemental Nutritional Assistance Program (SNAP). Just this week, the House Agriculture Committee approved a bill reauthorizing the program but at substantially reduced funding levels, so that 2 to 3 million low-income Americans, many of them children, would lose assistance. That bill isn’t likely to become law, but SNAP was a target for major cuts in the original House Republican budget and it will likely to remain a target of conservative attacks for some time. The immediate impetus for this assault is the program’s growth. One in 50 Americans were part of the program at its inception. One in seven are today. For a while, conservatives were content to blame Obama for this increase, because a lot of that growth took place during his tenure. Conservatives are particularly angry about a provision in the Recovery Act suspending time limits on benefits that served, in effect, as a work requirement. But there was a good reason to suspend the work requirement in early 2009: People couldn’t find work! As the Congressional Bugdet Office has concluded, the primary reason for recent enrollment increases is the recession and its aftermath. Many more people have been out of work or losing incomes. As a result, many more have needed financial assistance in order to put food on the table. In fact, the time limits are already back in effect (although states with high unemployment can apply for waivers, just as they always could). Current projections suggest that, once the economy recovers, SNAP enrollment should return, as a percentage of the population, to roughly what it was before Obama took office. And the program’s cost, as a percentage of the economy, should actually return to what it was in the 1990s. Spending on food stamps doubled between 2001 and 2006, even though unemployment was low in those years. Even when the economy is projected to improve in the future, usage of food stamps will remain elevated above historic norms. 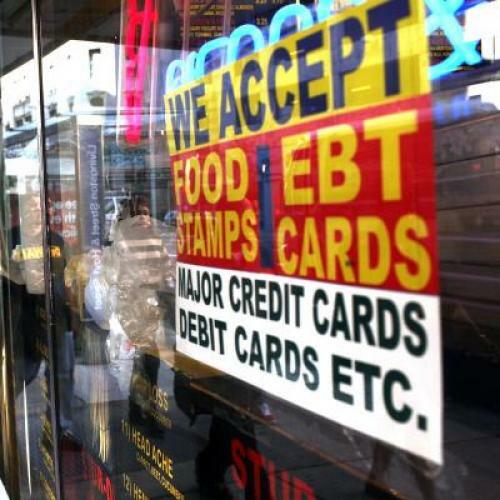 Food Stamp Nation is here to stay. … Newt Gingrich famously calls Barack Obama “the food-stamp president.” But the first president worthy of the moniker was George W. Bush. His administration brought a Madison Avenue element to the otherwise unreconstructed Great Society program. Not everyone who is eligible for food stamps knows it or wants to sign up. Bush began a recruitment campaign. In the same vein, the Obama administration is running radio ads hailing food stamps as a way to lose weight. At the local level, county governments spread the word and work to overcome residual cultural resistance to taking government benefits. The federal government pays $50 million in bonuses to states for signing people up. That’s a pretty damning story. It’s also a pretty misleading one. SNAP enrollment rose during the Bush years in part because, even when unemployment was low, poverty was high. And with more people in poverty, there were more people who needed assistance paying for food. The graph at right, from the Center on Budget and Policy Priorities, shows the effect pretty clearly: Enrollment tracks poverty throughout the Bush years. For most applicants, information had to be obtained from third parties, such as employers or landlords. Some applicants received unscheduled home visits, and some were fingerprinted. An ERS-sponsored study found that in 2000, applicants who were ultimately approved for benefits spent an average of 6.1 hours on the process and were required to make an average of 2.4 trips to the SNAP office. Prior to welfare reform, applicants spent an average of 3.9 hours and 1.6 trips to be approved for participation. In the years following welfare reform, SNAP caseloads fell 47 percent from 25 million people in 1996 to 17 million in 2000. Though the strong economy accounted for much of the decline in SNAP participation, evidence shows that policies that added burden to SNAP participation had an influence, as well. the SNAP benefit formula contains an important work incentive. For every additional dollar a SNAP recipient earns, her benefits decline by only 24 to 36 cents — much less than in most other programs. Families that receive SNAP thus have a strong incentive to work longer hours or to search for better-paying employment. States further support work through the SNAP Employment and Training program, which funds training and work activities for unemployed adults who receive SNAP. More generally, 95 percent of SNAP participants have incomes below 130 percent of the poverty line, or about $30,000 a year for a family of four. Forty-four percent have incomes that are less than half the poverty line, or about $12,500 for a family of four. SNAP doesn’t seem plagued by waste or fraud, either. Ninety-two percent of the program's funding goes to actual benefits. A 2011 report from the General Accounting Office found that program errors, including both people getting too much assistance and people getting too little, affected less than 4 percent of recipients. we have to remember that this is an ideological and even a moral issue to conservatives, who view dependence on any form of public assistance as eroding the “moral fiber” of the poor (as Paul Ryan likes to put it), and as corrupting the country through empowerment of big government as a redistributor of wealth from virtuous taxpayers to parasites who will perpetually vote themselves more of other people’s money.